Summer internships are available in both Columbus and OARDC-Wooster through various programs. Work experience and other opportunities often arise during the school year. Explore our Faculty Research Directory. If you see areas that interest you, you are welcome to contact faculty and inquire about their programs. In the Summer Research Internship in Plant Pathology (SRIPP) program, internships may involve laboratory and/or field based research, depending on the project. Interns can also participate in field trips, seminars and workshops, career and graduate study sessions, and various research forums on and off-campus. At the end of the internship, students will give presentations on their research experiences. Start and end dates may vary and are established between the student and supervisor, depending on school calendars. Many SRIPP students will begin a week or two after Ohio State Spring commencement (early May). The stipend is $10/hr, 38 hrs/wk (does not include housing, food or travel). At least sophomore status in an undergraduate degree program or have received a baccalaureate degree within the past year. A 3.0/4.0 or greater cumulative grade point average. Exceptions may be considered on a case-by-case basis. 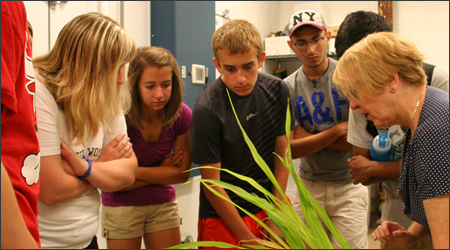 Interest in plant science, plant pathology, or plant molecular biology. Applicants not currently eligible to work in the U.S. can contact Monica Lewandowski (lewandowski.52@osu.edu) for more information. This program is open to students from all universities (not just Ohio State). Applications for Summer 2019 are due March 15, 2019, or until positions are filled.